IM001 is an iphone iPad iOS flash drive USB 3.0 with lightning connector for PC. 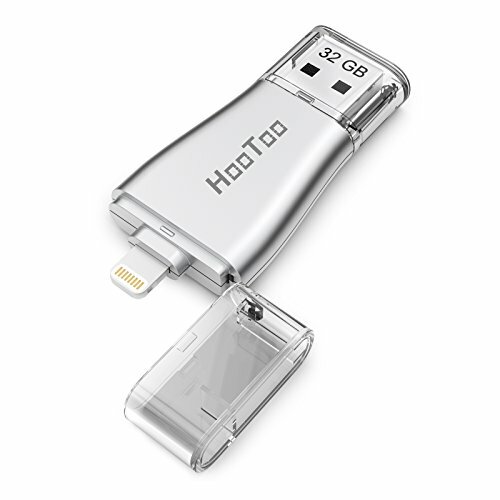 HooToo memory stick is MFi certified. The USB end plugs into any computer USB ports and offers USB 3.0 data transfer speeds. It reads up to 80 MB/s and writes up to 40 MB/s. Lightning port: up to 30MB/s reading speed, 10MB/s writing speed. At a fraction of the size and weight of an iPhone, it is the best companion for your Apple devices. Take it with you everywhere to instantly free up more space, letting you enjoy more content and have more freedom. And extra 3mm extension means the lightning connector works with most of thick cases without having to take them off. install Free APP "iPlugmate". You can use your idevice to stream movies and listen to podcasts stored on the flash drive directly, saving valuable spaces on your devices. 32GB of capacity, you can store more of the latest HD movies, take thousands of photos, grab more seasons of favorite TV shows, listen to more podcasts, and never worry about using up more space on your idevice without using iTunes or iCloud. Device Support:iPhone 5s 6 6+ 6s 6s+ se 7 7+ 8 8plus X; iPad (iOS 8.0 or higher), Computer OS Support Mac OS X v10.6+, Windows 7 8 10. 2) You cannot transfer or watch media files downloaded from iTunes or other 3rd party apps, as these files are Digital Rights Management protected. EASY AND SPEEDY TRANSFER BETWEEN IPHONE / IPAD AND COMPUTERS: AUTHORIZED exFAT, enables you transfer individual files larger than 4GB. Experience up to 80 MB/s reading and 30 MB/s writing speed with USB 3.0 port; lightning port: up to 30MB/s reading speed, 10MB/s writing speed. FRIENDLY STREAMING APP: The iPlugmate supports major video, music formats, enabling you to watch movies and listen music directly from the pen drive. STRONG BACK STORAGE: instantly free up your iPhone / iPad memory with 32GB of backup space - without using a cable or iCloud. Restore the contacts at one click, but for files on camera roll. OTHER NICE FEATURES: 1)Share documents to the 3rd party. 2)take photos and videos at anytime and anywhere, and save to the flash drive, other than your iOS device. 3) password and touch ID protection. CONVENIENT EXTENDED LIGHTNING CONNECTOR BASE: unique design featuring tethered caps makes sure your caps never get lost. Extra 3mm extension works with most of cases without having to take them off. (except for Otterbox, LifeProof, Waterproof case...)PLEASE REMOVE this kind of chunky case before using. PLEASE NOTE: 1)you could not transfer iTunes Music & Video files to thumb drive, as they are DRM (Digital Rights Management) protected. 2) Not support new iPhone 8/X, due to current limit.